Charles Hampson Grant made his first model aircraft in 1908 at the age of 14. The following year he progressed to a man-carrying hang-glider with a wingspan of 13 feet, on which he flew successfully after launching himself off the sloping roof of the family home. Further research with models led to a larger, biplane hang-glider that had ailerons and an undercambered wing section. With this machine, Grant made flights of over 400 feet at altitudes of 25 feet. 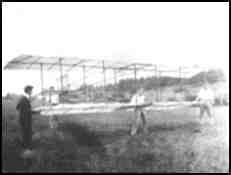 Model building continued in parallel with this full size activity, and he won a contest in 1911 with an A-frame pusher that equalled the existing endurance record. During 1912, in New York City, Grant won several long-distance events. He had specialised in directional flight control and won because his aeroplanes would fly distances of 2,200 feet or more whilst those of other competitors were prone to wander. Whilst Grant was studying at Princeton University, the USA entered the First World War and he volunteered for service in the Aviation Section of the Signal Corps, but a ruptured eardrum prevented him from serving as a pilot. After the War, Grant started a business selling completely assembled model aircraft. The enterprise was successful, but the financial backers did not pay the agreed royalties and the venture was abandoned. Later in the decade, a second attempt at mass marketing, involving an all aluminium aircraft called the "Silver Arrow", came to grief as a result of the Great Depression. During this period, Grant was experimenting with countless variations on the shape of the aerofoil and this led to the granting of a patent (1935) dealing with the variation of camber in flight by pivoting the forward and rear sections of the wing on the front and rear spars. Grant took over as editor of Model Airplane News in 1932 and boosted the circulation from 21,000 to over 300,000 by the time he handed over the reins in 1943. He wrote many articles, often using variations of the Cloud Tramp as examples and test beds, and promoted the formation of model flying clubs. His book, "Model Airplane Design", was also published during this period. He was an important innovator in the field of FF power models and designed the famous KG-1 Model which was one of the first really successful machines of this type. The KG-1 was built by his friend Joseph Kovel and made its first flight in August 1934 powered by a Brown Jnr. Grant produced the airfoil section used on the model by drawing round the outline of a trout! Charles Hampson Grant continued to produce new ideas in both model and full size aviation for the rest of his working life and variations on his flap designs and aerofoils are still in use today. He died in 1986. The above information was abstracted from an article by Wally Batter that was reprinted in the SAM 35 Yearbook No1 published in the UK.